Large alla prima oil on canvas – self portrait – 1989 -The Turning Point. International Women’s Day reminds me of the courageous women who have gone before and those who through example continue to encourage and inspire today. The symbolic imagery in this large oil on canvas (1990) speaks of all women. The brick wall behind the chest symbolises a special place….Everyone needs a special place in their hearts – to be in, to dream about and hope for. Photograph of the large self portrait.…symbolising awakenings and turning points. The quilt – symbolic of both peace and turmoil. The pewter vessel – Throughout the millennia – the vessel has symbolised the female. The silver egg cup – A talisman symbolising the day of my birth. The apple – definitely not forbidden fruit for me, rather a symbol of new life. The apple reminds me not to judge a book by its cover but rather to understand what’s at the core. Large oil on canvas – Symbolic self portrait – circa 1990. And I do believe that women can do just about anything that they put their minds, heart and soul to – the key is to never give up. 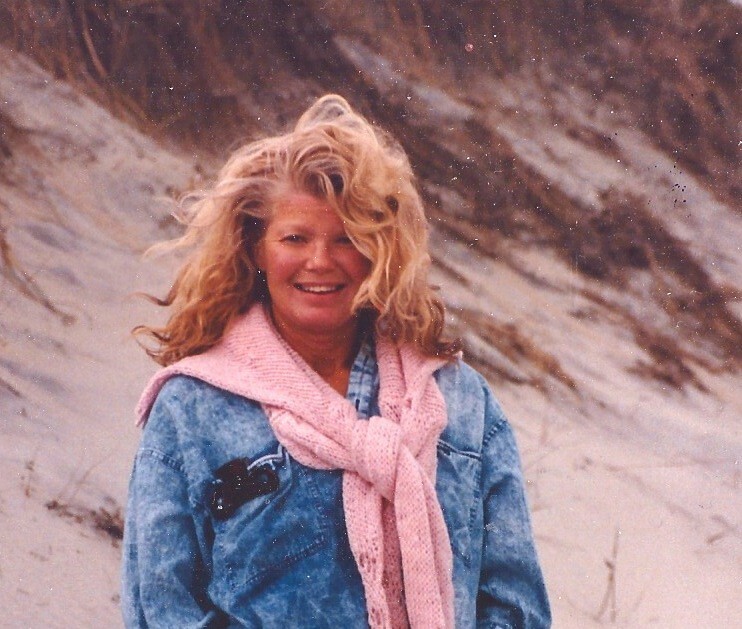 For those women who feel alone and whose lives are racked with struggle….this day represents a beacon of light and hope. It is an opportunity for women to come together. 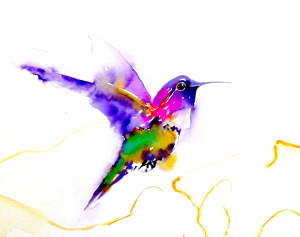 This magical hummingbird symbolises the unseen magic in our world, – something that each and everyone of us can tap into……. This entry was posted in Uncategorized and tagged 100th centennial of news chronicle newspaper, alla prima painting, favourite hats, International women day 2017, janet weight reed self portraits, Janet weight reed symbolic self portrait, magical hummingbirds, maya angelou words of wisdom, never give up, sliver egg cup, symbolic imagery, talisman, unseen magic in the world, Yes I can do it on March 8, 2017 by janetweightreed10. More from Frances Hodgson Burnett’s – The Secret Garden. I have been putting together offerings for my daughter Christie’s 40th birthday later this month…and thought the following passage taken from Frances Hodgson Burnett’s – The Secret Garden was perfect. 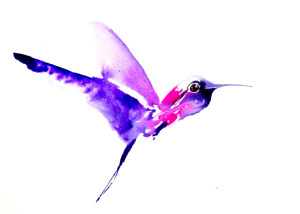 Of course, it must to be accompanied by magical hummingbirds. “One of the Strange things about living in the world is that it is only now and then one is quite sure one is going to live forever and ever and ever. One knows it sometimes when one gets up at the tender solemn dawn time and goes out and stands out and throws one’s head far back and looks up and up and watches the pale sky slowly changing and flushing and marvellous unknown things happening until the East almost makes one cry and one’s heart stands still at the strange unchanging majesty of the rising sun – which has been happening every morning for thousands and thousands and thousands of years. One knows it then for a moment or so, and one knows it sometimes when one stands by oneself in a wood at sunset and the mysterious deep gold stillness standing through and under the branches seems to be saying slowly again and again something one cannot quite hear, however much one tries. 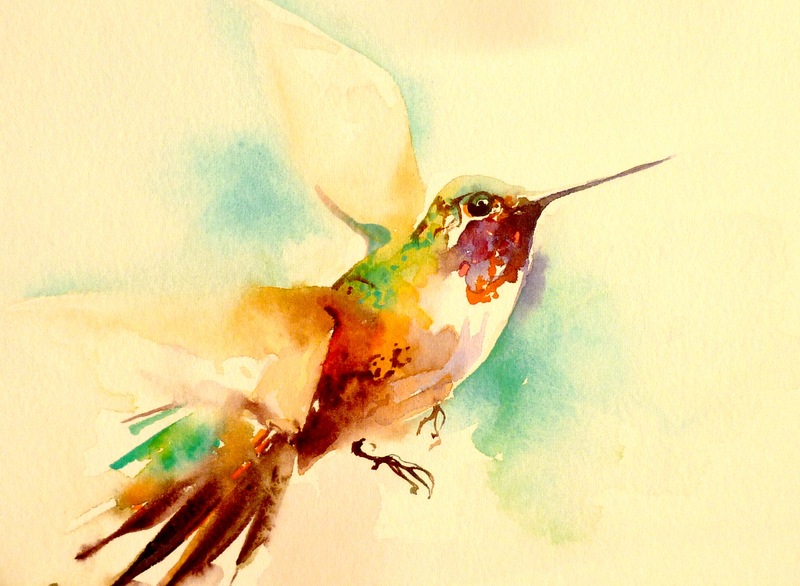 This entry was posted in Uncategorized and tagged 40th birthday present, Frances Hodgson Burnett, magical hummingbirds, the secret garden, unseen magic in the world on March 10, 2015 by janetweightreed10. 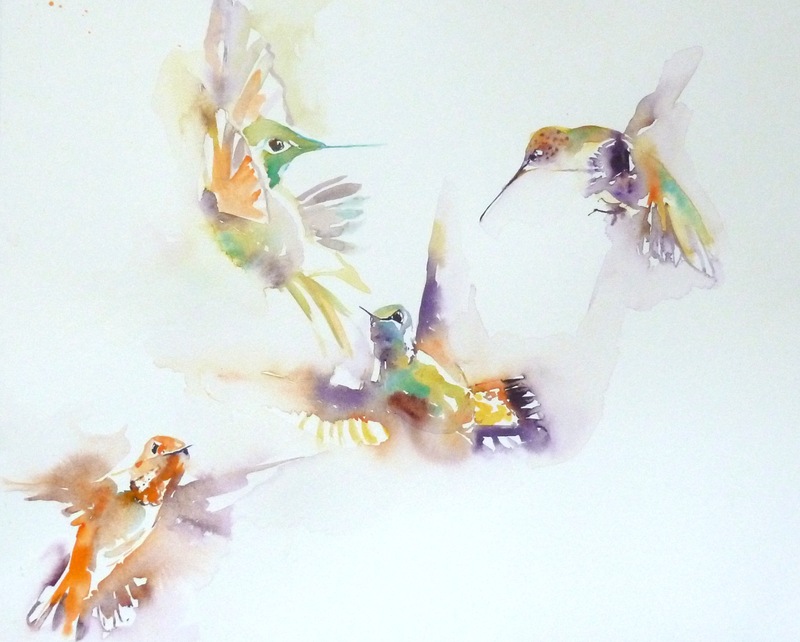 Gentle colour and hummingbirds for Monday morning…..
It’s that time of the year when many people start to yearn for spring and sunshine…..and in that yearning we often forget that animals and birds around the Globe are also starting to prepare for a new season and long journeys. 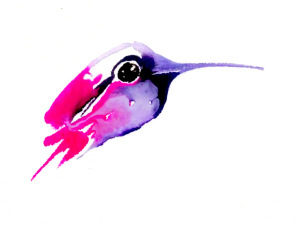 The tiny hummingbird is currently enjoying warmer climes…..but it wont be too long before it prepares for its long migration. These magical little creatures seek out colour in the form of beautiful flora and fauna which gives them the rich nectar they will need. Although at times our immediate environment might seem devoid of colour – it is always there waiting to bring energy and life. We just have to be aware of it, and open ourselves to the unseen magic in our world. 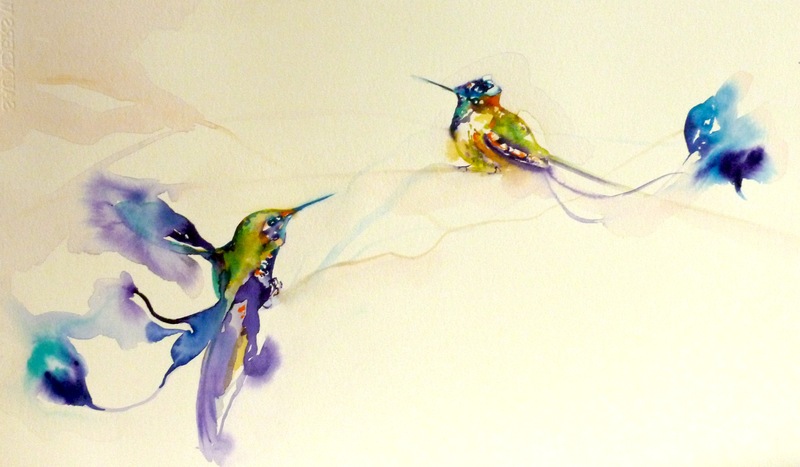 This entry was posted in Uncategorized and tagged janet weight reed, janet weight reed artist, magical hummingbirds, open to all possibilities, preparing for migration, the joy of colour, unseen magic in the world, watercolour hummingbirds on February 17, 2014 by janetweightreed10.